These little babies get to be about 1/2 to 3/4 inch high. Not too shabby. That quote is from a sitting Judge on the US Supreme Court. Family values, eh? But this post isn't about children. This is a post about pancakes. No, they may not be perfect, but that’s OK. I will love each one for what it is, not demanding perfection from my dinner. I say dinner, because these were last night’s dinner – Shrove (Fat) Tuesday dinner. For all you non-Christians (or those who weren’t brought up in a Christian household – there is a difference), Shrove Tuesday is the last day before 40 days of fasting in the lead-up to Easter. I hate to post a recipe for a celebration after it’s passed, but such is the life of a blogger. It happens at Thanksgiving, too. It’s hard to post about a turkey before it’s been roasted. Luckily pancakes are delicious any day of the week. Shrove Tuesday is a “floating” religious day that leads up to Easter, a Christian celebration dictated by the moon. Easter was determined by the First Council of Nicaea to be the first Sunday after the paschal full moon, the Spring moon. Kind of sounds like Christianity piggybacking on a pagan festival, doesn’t it? Early Christians did a lot of that, scheduling their festivals to coincide with pagan ones. It was easier to convert people that way. It had nothing to do with historical accuracy. Regardless, Lent starts 40 days of fasting, so the tradition is to get all the fat out of the house. Pancakes don’t really strike me as particularly fatty, but the tradition is they are served on Shrove Tuesday to help use up the fat. If you don’t have them something is wrong with you as a mother/wife/husband/father. I think some of the Catholic nations have more fun with Shrove Tuesday. They work out all their “passions of the flesh” in the lead up to Lent. The big, glitzy Samba Parade in Rio and the parades in New Orleans all happen on Shrove Tuesday. That was last night. Check YouTube today for video. But the big problem for all us boring Protestants is to find the most exciting pancake recipe that we can. The holy grail of pancakes is the one with the highest loft. How light and fluffy can you get them? This one does quite an admirable job. It uses baking powder (usual) and baking soda with vinegar (not quite so usual). Often pancake batter is supposed to rest to relax. There’s no relaxing for this batter. It starts to grow in the bowl right in front of your eyes. So be prepared to start cooking about a minute after mixing this together. That actually can be a good thing if you’re looking for a quick breakfast. Try them this weekend. I’ve made a few pancakes in my time, and these rank right up there with the best! Mix the milk, flour, sugar, salt and melted butter together in a medium sized bowl. Use a medium bowl because the batter will rise. Whisk in the egg until smooth. then add the baking powder and baking soda. Mix again until smooth. Then add the vinegar and mix. The batter will begin to puff up within a minute due to the reaction of the soda and vinegar. Place a non stick pan over medium high heat. Scoop the foamy batter out by 1/3 or 1/2 cup measures. Spread out to a 4" or 6” circle. 1/3 cup will yield 8 pancakes; 1/2 cup will yield 6. 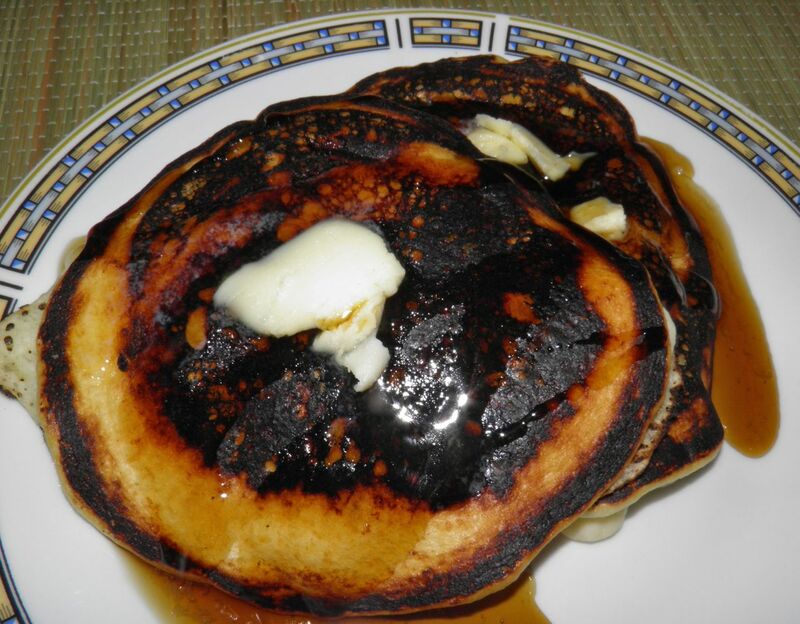 Serve with maple syrup and butter. Lots of both.